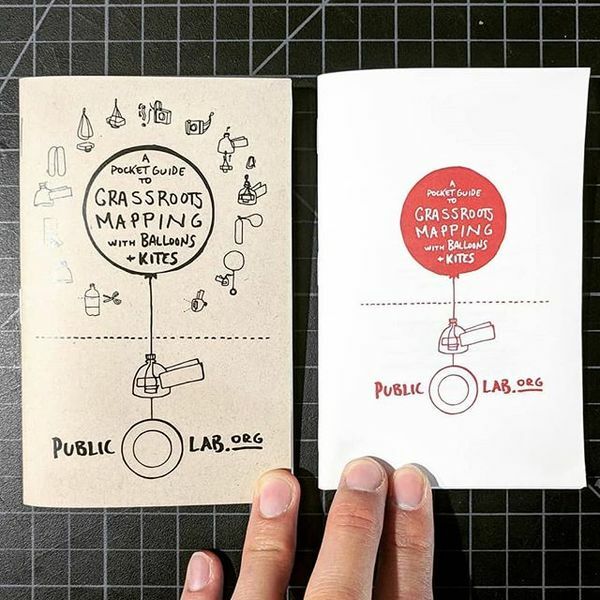 This 3.5 x 5.5 inch illustrated booklet was printed at the AS220 community print shop by Jacque Bidon, and includes 64 pages of illustrated community-developed guidance and tips on balloon and kite mapping. It was collaboratively written by dozens of Public Lab community members. Shown is the final mockup -- the final print will be in red ink. <3<3<3 awesome -- you can clone the whole Google doc or do it in InDesign or whatever -- i can help "bookletize" it -- was able to get it printing on a laser printer on 16 sheets of paper for a 64-page booklet that can be hand stapled and bound! I have a few of these handmade versions which are really nice. I used a Mac plugin to bookletize it but it's also possible with Ghostscript on the command line.